Railway Recruitment Board or RRB, one of the official hiring arms of Indian Railways, has announced (finally!) 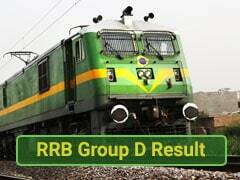 the RRB Group D result for various Boards. Among them, Indian Railways, one of the largest employer in the world, had released the RRB Chandigarh Group D result, RRB Chennai Group D result, RRB Kolkata Group D result, RRB Secunderabad Group D result, RRB Mumbai Group D result, and RRB Patna Group D result on their respective official websites. For your convenience, we have republished the RRB Group D results of all the RRBs mentioned above here. From the next page open, search for your RRB Group D registration number. If you can locate your registration number in the PDF open there, that means you have been shortlisted for the PET which will be undertaken by the Railways Recruitment Cells (RRCs) as per the latest decision by Ministry of Railways. For every updates on the PET and further procedures, now the candidates will be need to approach or wait for updates from the RRCs. Step Three : On next page, log in by entering the Registration Number and Date of Birth in DDMMYYYY format. Step Four : On the next page check your normalized score and short-listing status for PET.